Savannah established the country’s largest urban National Historic Landmark District in 1955. 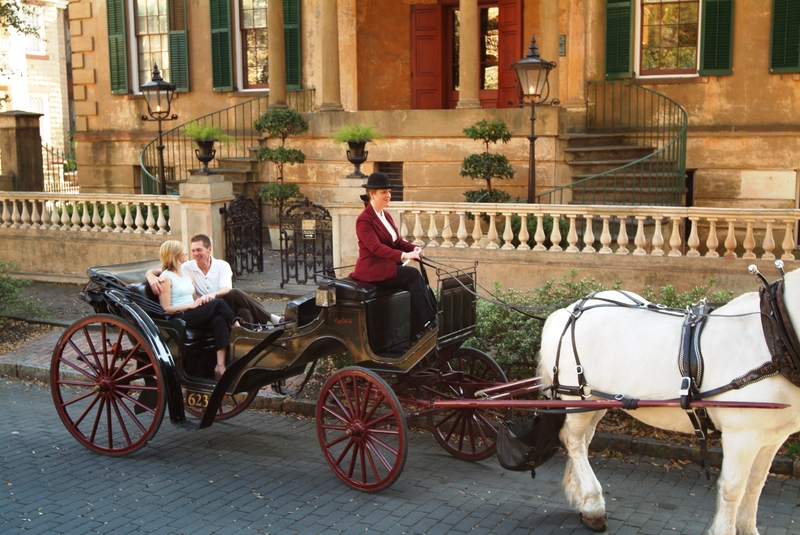 Here visitors enjoy a carriage ride around historic Savannah. A hard hat tour of the Roundhouse Railroad Museum in Savannah, Georgia, a National Historic Landmark. The Isaiah Davenport House Museum in Savannah, Georgia, was given the Preserve America Presidential Award in 2005. Savannah (population 128,500) was founded by General James Edward Oglethorpe on February 12, 1733, establishing the colony of Georgia. Prior to the English colonists’ arrival, Yamacraw Indians populated the area. Oglethorpe designed a town plan that largely survives today. Since that time the city has been the site of many historic events. The nation’s first orphanage was founded there in 1740. Three Savannah citizens signed the Declaration of Independence and three others signed the Articles of Confederation. One of the bloodiest battles of the Revolutionary War occurred in Savannah. Eli Whitney invented the cotton gin at nearby Mulberry Grove Plantation, and the first steamship to cross the Atlantic, the Savannah, left port here in May of 1819. General William T. Sherman ended his march to the sea here in December of 1864 and presented Abraham Lincoln the city of Savannah as a Christmas gift. The nation’s first public black college, Savannah State, was established in 1891, and the Girl Scouts of America organization began here in 1912 through the efforts of Savannah native Juliette Gordon Low. The largest contributors to the economy of the area are the Port of Savannah, tourism, education, government, and health. Savannah brings in more than $1 billion annually through heritage tourism, thanks in large part to the citizen efforts that saved most of the squares and buildings laid out according to the city’s 1733 plan. Many historic structures along the riverfront related to the cotton trade have been given new life as restaurants and shops. Savannah was a pioneer in historic preservation in America, establishing the country’s largest urban National Historic Landmark District in 1955. The Isaiah Davenport House, the catalyst for that effort, was given the Preserve America Presidential Award in 2005. The Historic Savannah Foundation’s revolving fund has been a national model for saving and rehabilitating endangered historic buildings. The city’s comprehensive plan includes an entire chapter dealing with sustaining its cultural and historic resources and calls for creating design guidelines for historic neighborhoods and for rehabilitating domestic, commercial, and industrial sites for affordable housing. Savannah is home to more than 20 museums, sharing its heritage with visitors and residents alike. One recent partnership with the Coastal Heritage Society involves archaeology, preservation, and interpretation of Battlefield Park, which includes 14 historic railroad structures and a Revolutionary War battlefield. The Roundhouse Railway Museum, a National Historic Landmark, is on this 25-acre site. Archaeologists have located the site of the original fortification and a historically based redoubt has been constructed to help interpret the battle. Residents have approved $14 million in sales tax funding for preservation projects at Battlefield Park. Savannah has a hands-on summer history camp to teach seventh and eighth graders preservation construction trades, and the city recently opened a preservation high school program.